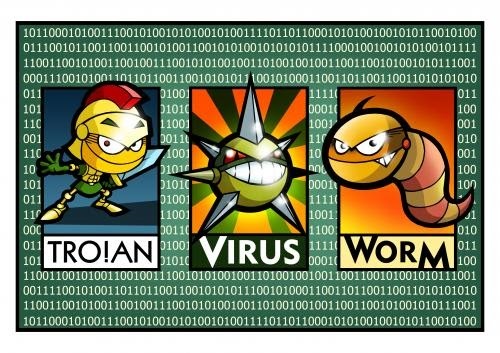 Summary: Difference Between Worm and Trojan is that a worm is a program that copies itself repeatedly, for example in memory or on a network, using up resources and possibly shutting down the computer or network. While a Trojan horse is a program that hides within or looks like a legitimate program. A certain condition or action usually triggers the Trojan horse. Unlike a virus or worm, a Trojan horse does not replicate itself to other computers. A worm is a program that copies itself repeatedly, for example in memory or on a network, using up resources and possibly shutting down the computer or network. Sometimes, it happens to you when you click a folder to open, it copies itself. And there is another copy of your folder because worm is a types of computer virus that repeats itself. Worms use parts of an operating system that work automatically and user can’t see it. You can only recognize a worm when your there are number of copies, when you computer is getting slow and slowing other tasks. A Trojan horse is a program that hides within or looks like a legitimate program. A certain condition or action usually triggers the Trojan horse. Unlike a virus or worm, a Trojan horse does not replicate itself to other computers. Trojan Mostly looks harmless but it is actually Malcious that can harm your computer. It was named after the Greek Myth about the Trojan War. According to legends, Greeks made a Large Wooden horse by which they pulled the people of Troy into the city. And at night, there are soldiers who have been hiding in that horse are out and opened the gates to let their fellow soldiers in and overran the city. Trojan force user to install malware which is looking like a legitimate program. And after being installed it can activate any program it wants to in the computer.